Clean and dry transmission fluid does more than transfer power, it also Cleans, Cools, Seals, and Lubricates. Most transmission hydraulic systems implement standard inline full-flow filters to control particulate contamination that can cause catastrophic failure. 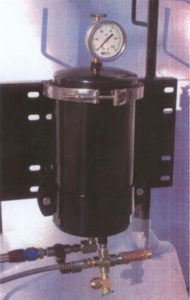 A 50 micron full-flow filter can do little to defend a transmission from dirt, wear materials and water. Particles measuring 3 micron and smaller contribute significantly to chain-reaction abrasive wear. The Black Gold Transmission Filter provides 1 to 5 micron contamination control and removes moisture to reduce wear, vehicle downtime, and extend maintenance intervals. 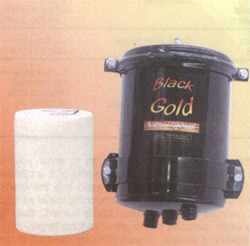 The Black Gold Transmission Filter was designed to be changed easily and efficiently. Simply remove the cover (no tools necessary), pull out the spent element and install the new element. The post in the cover of the housing ensures the element is properly aligned for maximum efficiency.